Last week we showed you what sort of stitches and needle sizes work best in Vivacious 4ply, so this week we thought we'd give you some ideas for patterns that would work really well in this yarn. Let's start with a sweater with attitude, Åsa Tricosa's Sweatrrr! Åsa has a really distinctive modern style which I love and this jumper is a perfect example of that. Knitted in Silver and Bronze Vivacious 4ply with a bold, contrasting sleeve insert and little intarsia squares, the colourwork is perfect for using up those part balls of gorgeous yarn that you can't bear to part with. It only takes 3 - 5 skeins of the main colour so it's a fairly economical sweater too. Best of all, it's knitted seamlessly using Åsa's Ziggurat top down method, so no sewing up at the end!! If cardigans are more your thing, then why not try Carol Feller's Autumn Whispers Cardigan? Another top down design, this lovely little cardi (shown here in Copper Tones) is knitted using a different but equally intriguing seamless technique, the contiguous method (which you can learn more about in the Contiguous group on Ravelry here). Carol has provided instructions for knitting short or three quarter length sleeves as well, so you can make whichever you prefer. It doesn't take much yarn either, between 2 and 4 skeins for the short sleeved version and from 3 - 5 skeins for the 3/4 sleeve version. I'm really tempted to make one of these for spring, it'd be perfect to throw on over a dress or jeans and a t-shirt! Veera has used Spiced Plum to contrast strongly with pale grey in her gorgeous modern sweater design, which we think is really flattering and easy to wear. I love the dipped hem worked with short row shaping and the button detail too! This crescent shaped shawl is knitted top down using two skeins of Vivacious 4ply (shown in Sea Green) and features botanical themed cable and lace patterns. 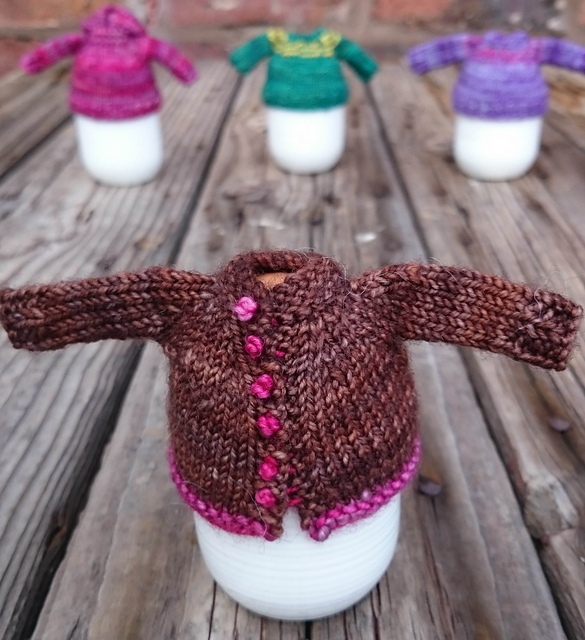 Ágnes's designs are really pretty, so her Ravelry page is well worth a look! We couldn't do a post on Vivacious 4ply pattern ideas without mentioning some awesome socks! Dawlish (shown in Sunshine) and Willowherb (shown in Mixed Magentas) by Rachel Coopey from CoopKnits Socks Volume 1 each use a skein of Vivacious 4ply and use the great stitch deinition that the yarn has in both cables and lace to great effect. We love the way these twisted stitches and cables look on this, the textures are just gorgeous. Last but not least, just for fun, is this little pattern that we did for Easter last year, Yolks! You only need a tiny bit of yarn so they're perfect for scraps and leftovers and the pattern is free too, so why not make some to dress up your Easter egg hunt this year? You can also see all our single patterns for Vivacious 4ply here and patterns in Vivacious Volume One here. P.S. Don't forget, our Becloud Hat pattern is still free with the code becloudhat until midnight tonight (GMT).